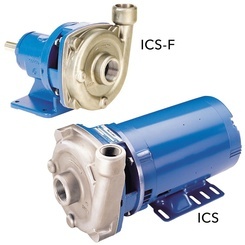 The Models ICS, close coupled, and ICS-F, frame mounted, are single stage, end suction pumps designed for ultra pure water systems, beverage processing, chemical service and selected OEM applications. The pumps are of back pullout configuration, with NPT suction and discharge connections and have investment cast AISI Type 316 stainless steel casings, open impellers and seal housing. All pumps are equipped with O-ring shaft sleeve protection and are available with a variety of optional mechanical seals. Close coupled units are equipped with C-face NEMA motors with threaded shaft extensions. Frame mounted units can be baseplate mounted and are available with spacer couplings or may be belt driven. Close coupled units are available with single and three phase ODP, TEFC and explosion proof motors. Consult with your distributor/dealer for additional information.